New more eye-catching reflective version of the Ortlieb Velocity Backpack 100% waterproof cycling rucksack. Its reflective-enhanced high visibility and its laptop-friendly shape makes it an especially sound urban backpack. However you get around, if you want to be sure your kit and your cargo arrives dry, consider this very smart Ortlieb Velocity Backpack. Made in hard-wearing laminated, waterproof, cordura fabric. Abrasion protection on the corners of the bag continue the hard-wearing theme. 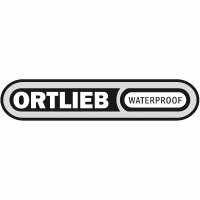 The welded seams and Ortieb's signature roll-top canoe-bag closure ensures the rain stays out. The bag's simple, single-compartment design maximises its capacity (compartments can diminish a bag's storage space). Shop tip: if you want to organise your luggage, use dry sacks. A zipped internal pocket keeps, for instance, your phone and wallet safe and accessible. This pocket is removable and can be attached to the waist pocket. The bag's box shape won't make your A4 folders curl. The padded shoulder straps and the large pads on the back of the pack make this bag comfortable to carry. Space between the pads allow air to circulate between your back and the bag's. A sternum strap makes the backpack even more stable. Three huge reflective stripes on the bag's hi-viz yellow background helps ensure you're seen, night and day. Alternatively, you can attach your helmet straps through the light mounting slots to make it easy to carry your lid off the bike. The four feet on the base should keep the bottom of the bag clean when you place it on the ground. Approximately 24 litre capacity, the Ortlieb Velocity Backpack is 47cm tall x 28cm wide x 15cm deep (18.5 x 11 x 6 inches).